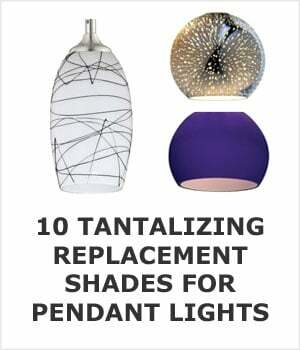 You may think of elaborate, artsy lighting when you think of pendant lights, but there are just as many simple, chic options as there are fancy ones. In reality it includes any light suspended from the ceiling by a cord, chain, or rod. Even hanging a ball jar with a bulb from the ceiling technically qualifies. In fact, this versatile lighting design works well in many rooms of your home and looks great with a just about any style of decor. Here’s what you need to know before buying one for your home. Apart from considering the materials you want, you’ll be faced with a wide assortment of design styles. Depending on what you want to use the lighting for, you can choose from several designs. As the name implies downlights direct their light downward. This means that the light is focused on one area, making it great for task lighting. Smaller downlight pendants are commonly used as focal point lighting for specific areas of a room. The smaller, more intense downlight draws attention to a specific spot and makes a great choice for illuminating desk areas or kitchen countertops. Uplights direct the light upward, reflecting it off the shade and letting it disperse naturally. Because it illuminates the ceiling or walls, it can add a sense of space to a room. The illumination is more ambient than practical, but with enough fixtures, it can be adequate for most uses. A drum pendant is what you want. The drum style shine direct light both upwards and downwards. The shade is in the shape of a cylindrical drum. These shades are often made of fabric, though other materials can be used to great design effect. You can find designs that use a single light bulb or that build many into the same lamp. The ones with multiple lights are typically two or three mounted to a single hanging fixture. These are ideal for rooms with only one electrical opening in the ceiling. They can be used to illuminate a larger area, such as along a countertop or over a dining room table. The kitchen is one room that can benefit from a wide variety of different lights. Because most lighting in kitchens tends to be of the overhead variety, you tend to see pendants used in kitchens a great deal. They offer flexibility and practicality–by altering the height and the styles, you can improve tactical lighting over food preparation areas and offer a more subdued ambience over your dinner table. When used with a dimmer, they become even more flexible, allowing for more intense illumination for task-work and gentler lighting for when ambience is more important. One spot that benefits from pendant lighting in the kitchen is the area above the sink. Since it’s such a heavily used area, most homeowners want lighting there that is efficient and practical, but they also want something that looks amazing. Pendants meets all these requirements and offers a great alternative to recessed lighting in this part of the kitchen. On this page you’ll find 10 that will fit the bill perfectly. Single bulb styles are effective, but if you have a wide sink you may want to consider one with two lower wattage bulbs to provide adequate illumination and to give the area a balanced look. Stainless steel and glass seem to be among the most popular finishes for these lights, though painted metal and shiny copper are also popular choices. Hang pendant lights 30 to 40 inches above the height of the kitchen counter. This is the right height to keep the fixture clear of spraying water while still allowing for ample illumination for tasks such as cleaning and preparing food. If someone in the house who’s fairly tall will be using the sink, you may want to hang it at the higher end of that range to avoid them bumping their head while they use the sink. An ideal spot for a pendant light or two is above the kitchen island. When hung above the island they pull double duty–they are necessary for task lighting and food prep, and they usually add a focal feature for the kitchen’s decor. When paired with a dimmer, by inclusing one or more over-island you can create an ambient nighttime glow in the kitchen, allowing just enough light to see without being too stimulating. As with over-the-sink lighting, over-the-island lighting needs to be installed at the correct height to maximize impact without interfering with usage of the island’s surface. As with the sink lighting, 30 to 40 inches from the surface of the island is the ideal height. However, keep in mind that if taller people will be using the island or if you have a hanging storage rack for cookware above the island, you may have to move the lamps up slightly to avoid physical conflict. For longer countertops or islands, multiple pendant lighting fixtures may be a great option, especially if you don’t want to wire in several of them (or don’t have multiple pre-existing electrical openings for the task). Choose one that’s both functional and that makes a statement, as the island is often the focal feature of the kitchen. Whether your dining room is separate from the kitchen or you dine in the kitchen itself, the lighting used above your table can make a world of difference to your decor. Pendant lighting makes any dining area feel cozier and welcoming. Plus, you can choose to illuminate the table more brightly with lower-hanging options or even better, or with the use of a dimmer switch. Most modern fixtures are fully dimmable but ask the salesperson just to be sure. Because lights above the dining table aren’t usually very close to where you might be working or standing, you can place them a little higher, between 30 to 36 inches from the surface of your dining table. This allows enough brightness for ambient dining or for doing tasks like homework without eyestrain. Make sure that you don’t hang them too low or they could cause a glare in people’s eyes while they are eating. Technically, a chandelier is considered a pendant lighting, but many homeowners are swapping out a large single chandelier for multiple smaller lights, which offer a more illumination of the dining area. Other popular over-the-table choices include downlights and drums. It would be uncommon to see uplights used here. Table lamps and wall sconces aren’t the only light sources that are great in living rooms. Pendant lighting is ideal for any room that requires specific, task-oriented or ambient lighting, so they’re perfect for living rooms. When hung from the center of the ceiling, pendants provide ample lighting to create a relaxing space to spend time with family and friends. Usually you see this implementation in ceiling that are 10’ tall or higher and not in living rooms with more traditional 8’ high ceilings. Pendants can be spaced along the length of the room to spread the light out, or they can be placed individually above seating areas or workspaces for accent lighting. Make sure you hang them at least 7 feet from the floor, higher if you have tall family or friends. 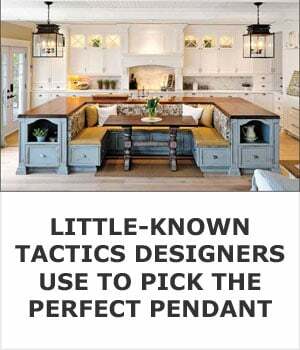 By varying the height of each pendant, you can create a look that’s both practical and unique. You can generally get away with hanging them at higher heights in a living room, especially if you pair them with a dimmer. If you are using them above a workspace like a table or desk, hang them between 28 and 32 inches to avoid them getting in your way while you work. The foyer is the perfect place to showcase beautiful pendant lighting. Chandeliers, especially large, ornamental ones, are the ideal lighting choice for foyers. They offer just enough of a glow, provide a welcoming ambience in the small space, without being too overwhelming. Because foyers can have much higher ceilings than other rooms in your home, you need to make sure the one you buy has enough length and dimension to be effective. 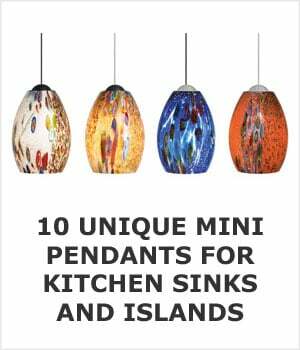 You don’t want to use a mini pendant here or one that hangs on a short cord. Make sure it’s high enough for traffic clearance, but not so high that it gets lost in the depth of the ceiling. Use your best judgment to determine the right height for your individual light. If your foyer extends up stairs, you might consider adding additional lighting to illuminate the stairwell. If you do, be sure to stagger the height of each light to balance the look and also to avoid having any hang low enough to be in the way of foot traffic. If you have a pool table or billiards table in your home, these make great sense. It provides the right amount of even illumination for gaming and will add a great deal of charm to the room. To make sure that they don’t interfere with the players, pendant lights above a pool table need to be hung at least 30 to 36 inches above the surface of the table. If you are adding a pool table to a room with existing pendant lighting, you will likely need to lower the fixture to the right level. If you are changing out existing lighting above a pool table, you might want to consider a multiple pendant row light, or one that is long and rectangular in shape. This will cover more of the table’s surface but only requires one electrical opening in the ceiling. Pendant lighting for pool tables can range from antique-look bars to more modern stainless steel and clear glass shades. If you’re looking for a light to double as a focal point in the room, consider one with a unique design or maybe a traditional ‘billiards’ feel, like the colored glass ones often seen in pubs and billiards clubs. When shopping for pendant lighting, you’ll probably notice that some are designed to be hard-wired into your electrical opening while others come with a standard wall plug. Is one type better than the other? It depends on where you plan to use them. Plug-in options tend to be slightly less expensive than hard-wired offerings. If you want to use them in a spot that’s near an electrical outlet, these can be a fine option, but if you are worried about the cords getting in your way, they can seem impractical. Plug-in lights tend to be better suited for accenting certain spots in a room rather than hanging in the middle (those cords draping across the room are both unsightly and impractical). Hard-wired lights are wired directly into an existing or a new electrical box hidden in the ceiling. This means no dangling cords that could pose as trip hazards and you can put them wherever you want, not just near an outlet. If you are handy enough to install them yourself, you may want to opt for this type for practicality, but even if you aren’t, an electrician can likely install them for you quickly and easily. In a lot of cases, plug-in lights can be converted to one that can be hard-wired. An electrician will be able to tell you how to do this, or they can do it for you. If you have any doubts at all about installing a hard-wired pendant light, get a professional electrician in. An incorrectly wired fixture can be a fire hazard and if you aren’t familiar with how your electrical system works, you could wind up electrocuting yourself in the process. When you start shopping for pendant lights, you’ll find that there are more design options than you may have realized. Unless you have a very specific style in mind, take the time to consider the options available. Choosing a one is more than just choosing a way to illuminate the room. Since light fixtures are often seen as ‘statement pieces’ in the home, you’ll want to make sure the design suits your style. 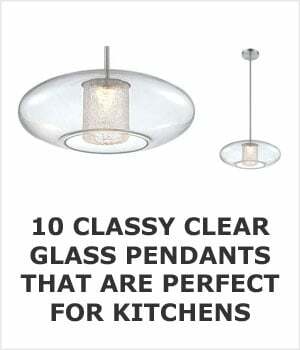 Glass pendant lights can range from simple, clear glass uplighters to intricate orbs of colored glass. This is one of the more popular choices because of the wide variety of styles and glass’s versatility–it just suits so many different decor styles. Modern designs tend to be edgier with clean lines and simple designs. Many of these are geometric in shape and made from materials such as stainless steel or glass. Strictly speaking, the term ‘modern’ refers to styles from the 1930s to the 1960s, while those from after the 1960s are considered to be contemporary. Contemporary designs often feel lightweight and ‘sterile’ in their look. LED pendant lighting isn’t a style as much as it’s a type of light that incorporates the use of LED bulbs. Many new options combine older styling with modern LED technology for a product that is more practical as well as beautiful, offering plenty of lumens at a fraction of the operating cost of incandescents. 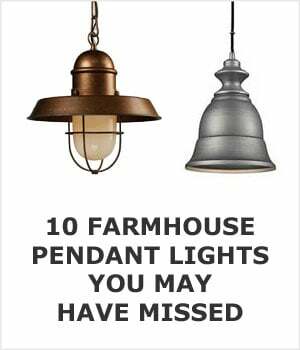 Vintage pendant lights are often fixtures that have been salvaged from old houses and other buildings. There’s been a surge in the trend for vintage and antique-inspired home decor in the past decade. Often these are used as focal points for a room’s decor, especially the larger and more ornate ones used in foyers. Rustic style pendant lighting tends to be designed to look good in rustic style decor settings, like farmhouse or log cabins. Basic metals, simple designs, and aged appearance are all classic features of this style. Industrial pendant lighting designs take cues from old industrial spaces such as factories. They tend to have a look that’s practical and no-nonsense, though this aesthetic is often used to create an unexpected bit of character in an otherwise bland modern decor, too. Globe pendant lights are typically made from glass, although some are accented with metals such as brass or copper. These can be simple glass orbs or classier metallic/glass combinations. As mentioned before, drum styles are cylindrical in shape and come in a wide variety of styles. From fabric shade drums to metallic ones, these can add personality and flair to your lighting. They’re good for highlighting specific areas in a room and suit many different decor styles. Retro options are designed to look old, but they’re actually modern. Retro can refer to any style that is derived from an earlier era, usually within the past 2-3 decades. Since most homeowners prefer a more modern decor, these make great accent pieces. Mini pendant lights are often used in clusters or groupings to provide adequate lumens in a smaller area. These smaller lamps are perfect for spaces such as above the kitchen sink or over a writing desk. The phrase ‘bar pendant light’ can reference either lights that are hung above a bar or breakfast bar, or it can reference multiple pendants that are mounted on a single metal bar. Both types are used to cast an even glow across the bar area for entertaining or eating. Chandeliers can be large and ornate or small and simple. They do add light to a room, but more than that, they add character and style to any setting. Chandeliers make a great statement in a foyer or dining room. Tiffany style pendant lamps are characterized by their colored glass shades reminiscent of a Tiffany lamp. These are most definitely scene-stealing lighting with lots of charm. Small Tiffany pendants work great over a bar or island while larger ones make great centerpieces for your living room or dining table. Beautiful antique pendant lighting options are often found in secondhand stores or salvage yards. Like vintage, these are often used in period-style homes to keep the decor authentic. Restored antique fixtures are often updated to make use of modern electrical systems and energy-saving bulbs. 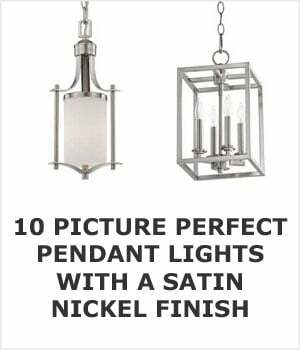 Lantern pendants look like they sound–like metal or glass lanterns with a glowing bulb inside. 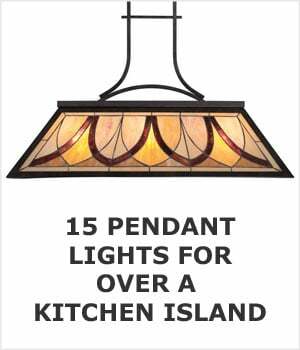 These are often created to look like antique or old-fashioned lanterns and are wonderful features for kitchens or dining rooms. Bamboo pendant lights are lightweight and modern, yet natural. They come in a variety of styles ranging from bamboo orbs to cylindrical drums. Country style tend to have a rustic design. Simple designs and materials such as wood, copper, and tin are typical characteristics. Iron pendant lights are heavier than their wooden counterparts. They can have an antique look that’s suitable for many different decor styles. They are simple statement pieces that look great in kitchens and dining rooms. The types of bulbs you use will depend on how the lamp is used. You don’t want harsh, bright light shining down on you at the dining table. You also don’t want weak, ambient light above your island or desk. Also, the type of bulb you use will depend on the fitting itself. Some use multiple small low watt ‘candle’ sized bulbs while others use singular, larger high watt bulbs. Be sure to check the manufacturer’s instructions before choosing a bulb as some fixtures may only tolerate bulbs of a certain wattage. Today’s newer LED lights and CFL (compact fluorescent) bulbs may not be suitable for antique or vintage pendant lights. Do keep an eye out for Edison style bulbs, however. Available as an LED, they combine that vintage look with low power consumption while supplying plenty of lumens. Some dimmers work with either CFL or LED lights, while others only work with CFL. Be sure to check your dimmer before buying your bulbs to ensure they will work. Also, if your fixture calls for an incandescent bulb, check with the manufacturer to see if they are also compatible with LED bulbs, since incandescent bulbs are not widely available due to their being phased for more energy efficient bulbs. Because there are such a wide variety of styles, you don’t have to settle for boring, generic lighting. Many home improvement stores will offer what seems like a lot of styles, but you can find many more by heading to your local lighting showroom. They will literally have hundreds of options for you to choose from, all hanging from the ceiling in the showroom. It’s worth making the trip if there isn’t one too far away. If you’re looking for antique or vintage pendant lights, don’t forget to check salvage yards and antique dealers. Just remember that any treasures you find here may need to be adapted to meet your modern electrical system. If in doubt, let an electrician help you with the conversion and installation process. If you want to save as much money as possible, then I recommend shopping online at one of the stores listed below. They have a wide selection for you to choose from at very competitive prices. You can also get model numbers from your local ligthing showroom (they’ll give them if you ask) and then pop them into a search engine to see how much you can save online.